Orgyenpa Rinchen Pal was born into the Gyu clan in Latö, northern Tibet. He belonged to a family of Nyingma tantric practitioners, who gave him the name Senge Pal. In his youth he mastered the Vajrakilaya and other teachings and practices of his father’s lineage, and the Sarma Vajrayana practices of Hevajra, Chakrasamvara and Vajrapani. Although he was naturally inclined to meditation, he decided that in order to practice properly, he ought to study the Dharma first. Accordingly, at the age of sixteen, he travelled to Bodong E monastery which was famous for the quality of its teaching. There he studied the various philosophical texts such as Abhidharma, Madhyamaka, Vinaya, and other topics of sciences, eventually gaining a reputation as a scholar. During this time, Orgyenpa met the Drukpa Kagyu master, Gotsangpa Gonpo Dorje, and became his disciple. Gotsangpa gave him Mahamudra teachings, and at the age of twenty Orgyenpa took full ordination at Bodong E, receiving the name Rinchen Pal. Orgyenpa studied Kalachakra and the major Kagyu teachings with Gotsangpa for twelve years, after which he expressed his wish to travel to Shambhala. Gotsangpa told him that Uddiyana would be a more appropriate destination, as he was lacking the karmic propensity to go to Shambhala. Following this advice, Orgyenpa travelled to Uddiyana via Kailash and Ladakh. On the journey he experienced visions of Vajravarahi, and had some unpleasant encounters with bands of marauding Mongolian horsemen. In Kashmir he only just managed to escape an attempt on his life, orchestrated by the king. Returning to Tibet he discovered that Gotsangpa had passed away and, deciding immediately to go on pilgrimage once more, he set off for Bodh Gaya in India. He travelled, studied and practised in the sacred places of Nepal, India, China, Pakistan, Kashmir, Tsari, Mount Kailash, Jalandara, and Ladakh. He showed signs of great accomplishments in his practice and attained miraculous healing powers, becoming known for his ability to cure disease and subjugate demons. On account of his growing reputation, upon his return to Tibet he was summoned to Mongolia to appear before Khubilai Khan. After bestowing a Kalachakra initiation upon the Khan and refusing his repeated invitations to remain at the court, Orgyenpa returned to Tibet. On the way back he met Karma Pakshi, the Second Karmapa, and became a disciple. At the age of fifty-three, Orgyenpa received the full Kagyu lineage teachings, transmissions and oral instructions from Karma Pakshi, going on to attain great realisation and becoming inseparable from his Lama. 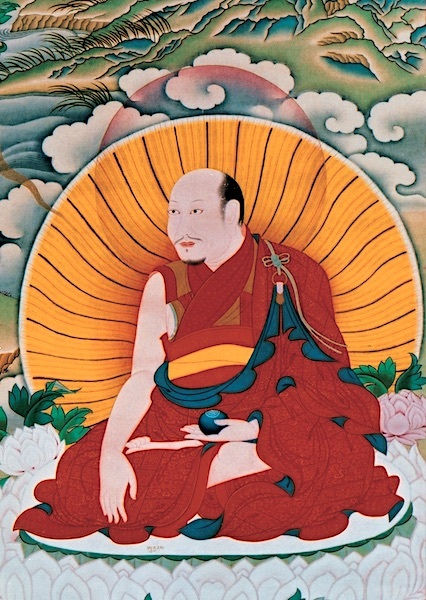 Orgyenpa’s activities of benefiting beings flourished throughout Tibet and India, bringing many to accomplishment through Gampopa’s tradition of Mahamudra teachings. Orgyenpa passed away at the age of eighty, leaving numerous yogi and scholar disciples in the Drukpa and Karma Kagyu traditions. Among these he had four renowned sons — two brothers of Nyedowa, Chöje Kharchuwa of Yazang, and Jamyang Sönam Öser of Langkhor; as well as eight close sons, four supreme ones. However, in accordance with the prediction of Karma Pakshi, Orgyenpa was able to locate and guide Rangjung Dorje, the Third Karmapa, who became his main disciple and lineage holder.